Anthony was placed into care when he was 14 years old after enduring physical and mental abuse at home. He’s had many ups and downs during his time in foster homes and once harbored suicidal thoughts, which landed him in Brunswick Hall for eight months and two other facilities thereafter. During his time at these facilities, Anthony developed his special skill of writing—some of which have been very successful and featured in the Huffington Post, NY Times and REPRESENT magazine. Eventually, Anthony found stable ground when he moved into a kinship foster home with his aunt and cousins. Anthony soon discovered the Little Flower LGBTQ Teen Group and has been a core member and leader in the group since joining. 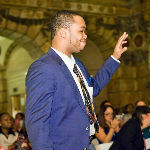 Staff witnessed the impact Anthony made on the lives other young adults in group. He encouraged his fellow teens to stay and complete high school, which he was able to do himself after thoughts of transferring or dropping out, because of the support he received from the group. Anthony helped members overcome their own challenges by sharing his experiences in dealing with bullying. He has been helpful in creating an environment for his peers to learn of opportunities, resources and information to help transition out of care as well as learn how to be their own self-advocate. Anthony recently aged out of care and is excelling in college all the while still finding time to join the group during meetings and offer help. Because of the dedication and care Anthony showed his peers, he was awarded the Administration for Children’s Services LGBTQ & Ally Award in 2014. Anthony was both surprised and excited when he heard the news of being selected as the recipient of the LGBTQ & Ally Award. He has demonstrated his commitment to safety and well-being of his peers as well as made a tangible impact by supporting his fellow foster youth! We look forward to hearing more about Anthony’s future successes!